Smart people do their homework, rely on past experience and pattern recognition to guide future behavior, and practice. But really smart people often "wing it," preferring to use their towering intellect to smoothly navigate thorny situations that would frighten lesser mortals. 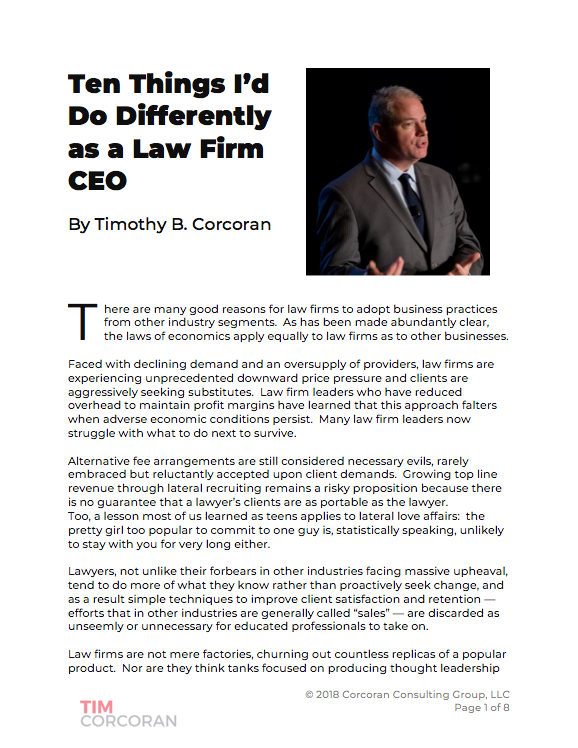 And so it is with many law firm partners who face the same client questions and objections again and again, and who fail to think through, memorize, and practice their responses. A cultural touchstone in the U.S. and numerous countries around the world is the game show Wheel of Fortune, in which contestants compete for the opportunity to solve a word puzzle one letter at a time. In the final round, the contestant may select several consonants and a vowel, and then the clock starts. Contestants correctly guessing the word puzzle before the clock stops win the grand prize. The odds of winning are largely influenced by the letters a contestant selects. Over time contestants learned the most common English letters are R, S, T, L, N, and E, so these became the default guesses by every contestant in every episode. Eventually the producers conceded these default letters, so now the final puzzle starts by plugging in these letters and then allowing the contestant to select an additional three consonants and one vowel. The lesson to be learned is that we can increase our odds of winning in any business setting by seeing patterns and understanding the key differentiators. In your world, what is your RSTLNE? I've managed quite a few sales teams, and one exercise we've always completed for every product or service, at least once a year, is to review our most common client objections. "Your product costs too much" or "You lack feature X but your competitors have it" or "Your organization is too small and we're afraid our needs will tax your support infrastructure" or "We can't secure buy-in from senior management to proceed" and many more. We've all heard the same challenges and one of us, or collectively all of us, can articulate a reasonable response to address each concern. To be clear, the goal isn't to develop some smarmy verbiage to hide our shortcomings or mask our price point. Our goal is to focus on the value we deliver, how prior clients have derived quantifiable benefits from our offerings, and offer suggestions for how similarly situated clients have overcome these same obstacles. Nothing demonstrates experience like acting as if you've been there before. Pithy responses to real concerns won't cut it. So we work on this, we write simple, accurate, effective responses, and we practice, even role-play, our interactions with clients. Corporate procurement officer (interviewing law firm partner, who hopes to win the designation as a "preferred lawyer" for the company's legal needs): "What makes you different than the other lawyers we're evaluating?" Lawyer: "Well, I have a great deal of experience in this industry segment, we hire only the finest lawyers, and we put our clients' needs first." Procurement: "Okay, but everyone else we've interviewed says the same thing. What makes you different?" Lawyer: "Um, we've worked extensively with companies like yours and we really care deeply about our clients." Procurement: "Thank you, but you've really just repeated your earlier remarks." Lawyer: "Did I mention that we can offer preferred rates?" Procurement: "We expect preferred rates from all of our providers. Don't call us, we'll call you." What's your RSTLNE? In your practice, your business, your domain, what challenges do you face every day? Have you written them down? Do you have a scripted response? If I were to ask each partner in your practice group how to respond to a handful of simple questions about price, quality, communication, service delivery, responsiveness, change management, project management, or billing, would I receive the same response? If not (I'm being gentle, the answer is of course not), I recommend you schedule time to gather the partners in a room with a whiteboard or a flip chart and work on this together. It's a simple process. Ask everyone to list the objections or concerns they routinely hear from clients or prospective clients. After capturing a couple dozen responses, have everyone tick off their top five selections. Add up the votes and focus on the top five, or at most the top ten. For each objection, identify the root concern. For example, "Your rates are too high" could have a number of meanings, e.g., comparable firms offer substantially lower rates for the same services; this is important to us but we have no remaining budget this year; this is not a high priority or we'd find the funds; you haven't proven that you're experienced enough to warrant high rates, and many more. Many objections are smokescreens. What is the real underlying concern? Begin listing elements of your response. Focus on benefits, not features. "We're global" isn't a benefit, it's a feature. A benefit answers the client's question, "So what?" A potential client with a global footprint with similar needs across borders and time zones might find a global law firm offering consistent services and rates to be a cost-effective alternative to hiring numerous local counsel to reinvent the wheel, so position it that way. Avoid statements you can't prove or that everyone else can state just as easily. "We care about our clients" is nonsense. So does everyone. "We care about our client's legal spending, so we've adopted a rigorous approach to matter budgeting with a 5-step process to communicate in the event the scope of the matter materially changes our cost or time estimates" conveys the same sentiment with detail. Capture a handful of statements to address each of the objections or concerns. Delegate the work of writing up a concise narrative for each. Spread the work around. Ten objections can be handled by ten different people, or teams. Ask a valued member of Marketing to be the editor. Every first draft will be too long, too lawyerly, and simultaneously too detailed and too vague. Count on it. Get over it. You write well in legal documents. You're not a good writer for crisp, effective, responses to common objections. This takes practice. Trust that none of the partners is a good proxy for a client's perspective, so whether an individual partners despises the draft or loves it is meaningless. An objective observer, potentially even a valued client, or a friend who's not a client, or of course your credentialed Marketing professionals, have a better ear for this than the partners do. Trust me on this. Reconvene and practice. Set up simple role plays where one partner plays the client and raises the objection and the other partner shares the prepared response. Even better, video record these role plays and review them for brevity, sincerity, and body language. Implement some gamification, set up a Shark Tank panel and vote on who does it best, who's prepared, who's polished, who's sincere, and give prizes for achievement. Then schedule extra help for those who don't get it right away. Most won't. It's like taking a dance class, it feels like you have three left feet until you get the hang of it. This checklist is a simple process. Yet, sadly, too many practice group chairs will discard the exercise as unnecessary, or too time-consuming, or possibly even insincere. The grand prize in the game show of business development typically goes to those who work the system rather than try to beat the system. Partners are busy people, to be sure, but when there is limited time, budget, and resources to generate new clients and new revenue streams, it's worth putting in the extra effort. Smart people do it. Super smart people tend not to. Which calls into question whether we've been too generous with that label.